Just as the weather heats up, cool down with this refreshing beverage. Perfect for a mid-day BBQ. Enjoy this thanks to our Featured Foodies over at DuoDishes.com! Pour the sugar and 1½ cups water into a sauce pan and cook over medium high heat until it forms a thin syrup, approximately 7-10 minutes. Remove the sauce pan from heat and allow to cool for a few minutes. Pour into a glass jar or bottle and add the lime zest and ginger nub. Set aside to steep and cool completely. In a large pitcher, stir the lime juice, vodka and triple sec together with 5 cups of water. Once the ginger lime syrup is ready, remove the ginger and pour the syrup in the pitcher. Stir well. 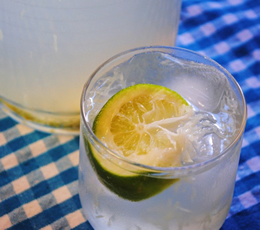 Serve over ice with a few slices of lime.